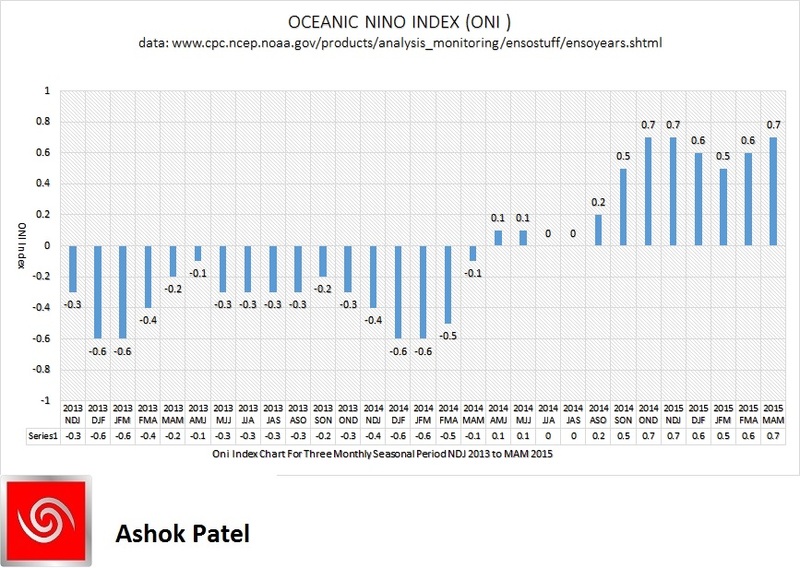 Full fledged EL Nino was confirmed at the end of March 2015 when the five consecutive 3 monthly seasons had ONI index of +0.5 C or higher. The Table below shows the monthly SST of Nino3.4 Region and the Climate adjusted normal SST and SST anomaly for last one year. March, April & May 2015 SST anomaly for Nino3.4 region is used to calculate the ONI Index for MAM as +0.7ºC. El Niño: characterized by a positive ONI greater than or equal to +0.5ºC. 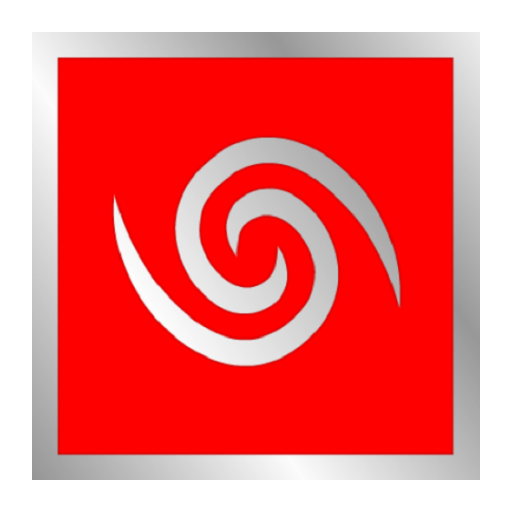 La Niña: characterized by a negative ONI less than or equal to -0.5ºC. By historical standards, to be classified as a full-fledged El Niño or La Niña episode, these thresholds must be exceeded for a period of at least 5 consecutive overlapping 3-month seasons. Total of seven consecutive 3 monthly seasons have had ONI Index +0.5ºC or higher. The respective seven ONI Index are SON 2014= +0.5ºC and OND 2014 = +0.7ºC, NDJ 2015=+0.7ºC, DJF 2015=+0.6ºC, JFM 2015=+0.5ºC, FMA 2015=+0.6ºC & MAM 2015=+0.7ºC. This El Nino is currently classified as a Weak El Nino since the ONI Index is yet below +1.0ºC. CPC had issued an El Nino Advisory on 5th March 2015 in anticipation that JFM 2015 ONI would be 0.5ºC or more. CPC considers El Niño or La Niña conditions to occur when the monthly Niño3.4 OISST departures meet or exceed +/- 0.5°C along with consistent atmospheric features. These anomalies must also be forecasted to persist for 3 consecutive months. As per BOM, Australia: The Southern Oscillation Index (SOI) has dropped further over the past two weeks, remaining firmly within El Niño values. The latest 30-day SOI value to 24 May is −17.4. The 30-day SOI has remained below El Niño thresholds for more than two weeks. The 90-day SOI has also dropped below −10; indicative of a persistent three-month period of higher atomspheric pressure in the western Pacific. Sustained positive values of the SOI above +7 may indicate La Niña, while sustained negative values below −7 may indicate El Niño. Values of between about +7 and −7 generally indicate neutral conditions. The latest 30-day SOI value as of 5th June has gone up to −13.3. SOI Monthly graph till end of May 2015 – The Long Paddock – Queensland Government. The Latest 5th June 2015 30 days SOI was -12.45 . This is the only El Nino to have been declared as full fledged El nino at the end of March of any year from 1950 on wards. EL Nino aa varshe pan bharatiya chomasa ma sakriya 6 ? EL Nino fakt ekaj paribad chomasa maate nathi. EL Nino haju shakriya chhe. Jokey EL Nino Bhartiya chomasa ma kya vistar ne asar kare chhe te koi chokkash kahi nathi shaktu. Sau hava ma teer maarey chhe !